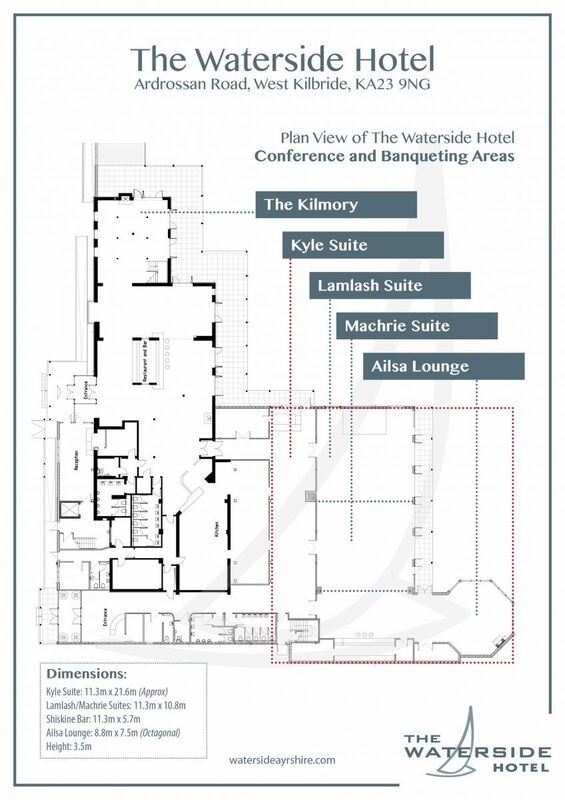 Plan view of the Conference and Banqueting options at The Waterside Hotel. The Stunning Waterside Hotel provides a full range of configurations, from two-250 to meet all your Conference and Business needs. The main Kyle Suite will comfortable seat 250 delegates in the style of seating required for you. For more intimate gatherings the Kyle Suite can be split into smaller areas such as the Lamlash and Machrie Suite or the wonderful octagonal space in the Ailsa Lounge. All Conference areas of the enjoy natural light from the floor to ceiling retractable doors that lead onto the verandah, private garden to reveal panoamice views to Arran. The Kilmory is another option in the Mezzanine area at the restaurant and is another popular choice to consider. The Atrium Room is situated on the first floor of the hotel and is a wonderful space that can cater for up to 50 delegates. A private space that can be configured to suit your individual needs and would also be an excellent choice for a business BBQ with open spaces leading off the main Atrium Room.